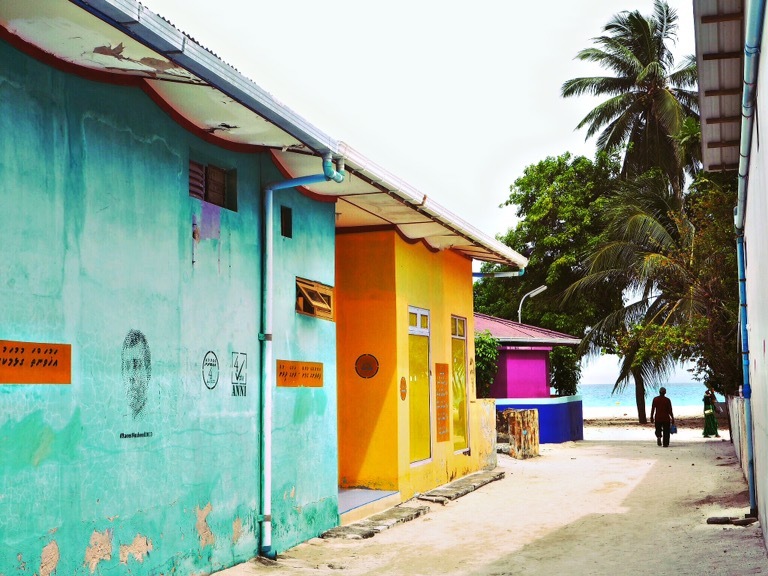 Maldives – Sometimes the wrong train will get you to the right place. The Maldives wasn’t really the first country on our radar, but it certainly made an impression on us during our visit. 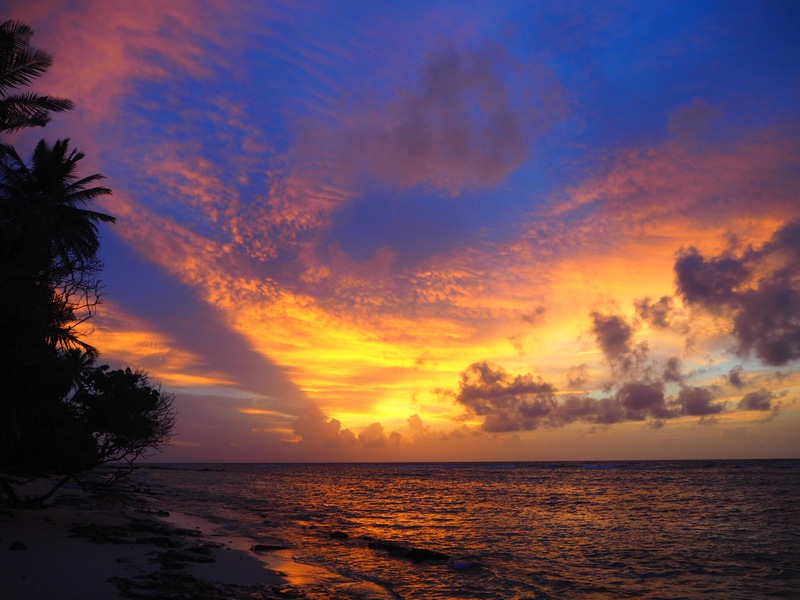 The tiny atoll nation of almost 400,000 in the Indian Ocean definitely left us enamored. Made up of around 1200 islands over 26 atolls in total, nearly half the population of the country lives on the tiny capital island of Malé. Of the 200 inhabited islands, almost half are resort islands where no locals live. The people of the Maldives are mostly muslim and look very much like the people of southern India. Being a muslim country, the dress is fairly conservative and alcohol is forbidden. A definite beach vibe permeates the fashion though, so you see a lot of younger men adopting a sort of surfer look. Their long, curly hair and shades make them look something like Michael Jackson from Thriller partway through his zombie transformation. Since bikini-wearing in public is a no-no, most islands have a dedicated “bikini beach” (which is usually not as nice as the other beaches, by the way) where foreigners can go to swim in western swimwear. Foreigners can also go to the normal beaches, but they’re expected to cover up. To us, the food was one of the best parts. Fresh tuna is everywhere, and most of the meals consist of it. Tuna curry, tuna fried rice, tuna fried noodles, grilled tuna, all are common for lunch and dinner. The traditional Maldivian breakfast is ground tuna mixed with red onion, coconut, and curry leaves eaten with roshi, a type of flatbread. First, it should be noted that this tuna is unlike anything we’ve had anywhere else. It seems like a completely different food from the tuna that comes in a can, or even the fresh stuff that you can get at grocery stores back home. Fresh juice is available from all of the local fruit (mango, coconut, papaya, pineapple, etc) and you can get it practically anywhere. It’s so delicious that it works as a pretty good substitute for alcohol, and we found ourselves going for a glass of fresh mango juice when we normally would have had a cocktail or a beer. It’s common to add sugar to the juice as well, so if you’d like it without, it’s important to ask. Most people understand and speak at least a little English, so communicating with the locals is usually pretty easy. Most transportation is done by either speed boat or dhoni, a type of local ferry. Speed boats are much faster and more flexible, but they’re also extremely expensive if you’re not sharing one with a few others. You can easily spend $300 on an inter-island speed boat trip. Dhonis are the better choice for the budget-conscious traveler, costing between $5 and $15 for a typical trip, but you’ll need to plan around their schedules which can be restrictive and unpredictable. Hitching a ride on a cargo boat is also possible (and very cheap), but they don’t run very often. It’s also worth noting that the government ferries (with the exception of the airport ferry) don’t run on Fridays, so try to avoid inter-island travel on Fridays. We found that the people in the Maldives are friendly and honest. The community has a close-knit feel, and people are eager to help out in any way they can. Connections are deep in the Maldives, and its easy to set up a boat trip outside of the official ferry schedules just by asking around; most people either own a boat or know somebody with a boat who’s willing to take you where you need to go. Cash is king in the Maldives, and the US dollar reigns supreme. 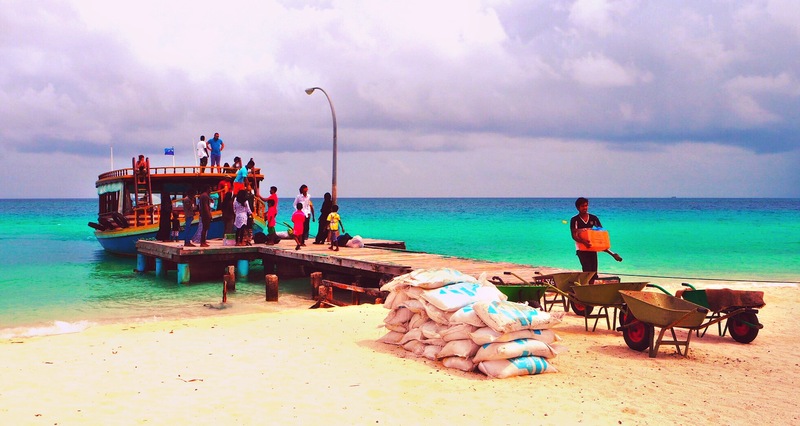 Many of the islands (with the exception of Malé) don’t have an ATM at all, and card transactions are taxed heavily, so most of the local economy runs on cash. Make sure you bring enough to cover your whole stay. US dollars carry much more weight than the local rufiyaa, so it’s wise to pay for larger purchases in dollars. Our first stop was the bustling city of Malé. The main airport is right next to Malé on its own island, but it’s a short ferry trip to one of the jetties on the north side of Malé. Practically every piece of developable land on Malé has a high rise building on it and the island is very small, so it’s easy to walk around. The southern half of the island is mostly industrial, so you won’t be missing anything by sticking to the north side. Aside from the novelty of such an island city itself, it’s not particularly interesting. The hot and humid weather makes city life pretty miserable for the visitor, so don’t plan on spending much more than a night there if you don’t have to. Some good restaurants to occupy your time until your ferry leaves are the Seagull Cafe on Maafannu near Sultan Park and Sea House above the Hulhumalé ferry terminal. The island-operated Friday night ferry from Malé to Thulusdhoo was cancelled the night we were supposed to take it, due to a forecast calling for rain and wind (which never happened). We were stuck in Malé and eager to get to somewhere more relaxed, preferably with a nice beach. We ended up shelling out $200 for a 45 minute speed boat ride just to get out of Malé, but about 10 minutes after departure the engine broke down. They called for another boat to come pick us up. It turned out to be a dhoni rather than a speed boat, but for the same price. The trip took considerably longer than by speed boat, but we had some dolphins swimming next to us for a bit. We eventually made it and we were just glad to be somewhere else. With the sun setting, we checked into our guest house and immediately went for a swim. Thulusdhoo is known for its two surf points: Cokes point and Chicken point. 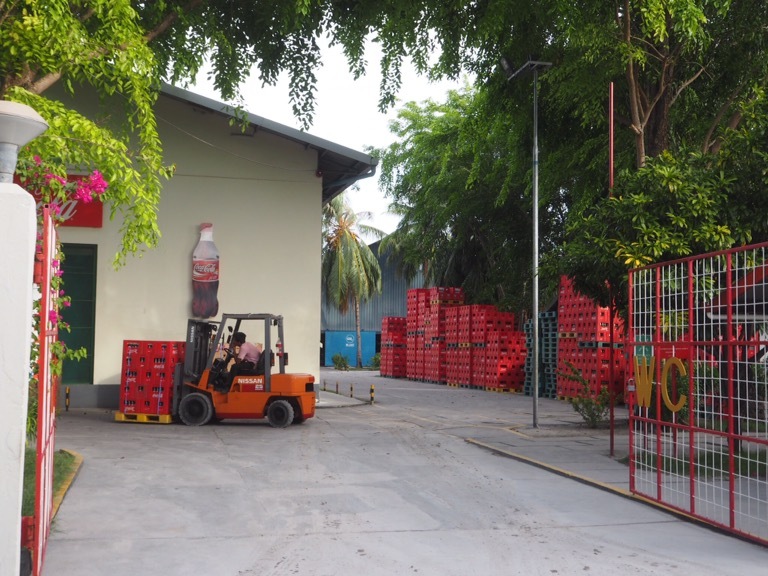 Thulusdhoo is also home to the only Coca Cola bottling facility in the Maldives (hence the name Cokes point), you can check out the factory near the dock on the northwest side of the island. We stayed at the Ocean Cottage guest house, which was pretty decent. The owner was out of town, so there were some teenage guys running it, but they were super friendly and helpful. During our one full day on the island, we spent most of the day having a picnic on Viligilimathidhahuraa island (more commonly referred to as Chicken Island, for obvious reasons) right near by. We would definitely recommend a trip over there, as the beaches were nice and the island had a sort of Robinson Crusoe paradise vibe to it. Only five people live there and we didn’t see anybody the whole time, so we definitely had space to relax. Hands-down our favorite island. We spent most of the early part of Sunday getting there from Thulusdhoo via a stressful and sweat-soaked foot journey from the north jetty to Vilingili Jetty on Malé. We arrived in Fulidhoo in the early afternoon and immediately fell in love with the place. The beautiful white sand and turquoise water, the colorful little mosque and minaret visible from the port, the quaint little main street dotted with shops, the yellow cafe near the jetty, the list goes on and on. The locals on this island were so friendly, everybody says hello to each other when passing by and it has a very small-town feeling to it. We stayed on Fulidhoo for three days, at Thundi Guest House. The guest house was nice, and the owner was friendly and helpful, but the food there is on the expensive side. It costs about twice as much as the one cafe in town (near the jetty) and is not particularly impressive. All the guest houses on the island are weirdly concerned about how good the other guest houses’ cooking is. The only tourists on the island were us and three other couples, but we ate with the others at their guest house one night and both our guest house cook and theirs asked about their food compared to the others. Most of our time here was spent relaxing on the beach and walking around town, but we did go snorkeling one day. It was my first time snorkeling so it took some getting used to for me, but Oona is totally at ease underwater. The trip was organized through the guest house and was reasonably-priced, but their gear was not the best, so the mask and fins didn’t fit well and were uncomfortable. On our last night on Fulidhoo, there was a dance event at the cafe. Many of the local young men put on traditional dress and sang and danced with drum accompaniment. It had a sort of Bollywood feel to it, but both the music and dance were great. Having to leave Fulidhoo left us a bit depressed, but we got on the northbound dhoni and bade farewell to the beautiful blue and white island. We had heard great things about Maafushi as well, but we weren’t sure what to expect. Our initial impression of the island was not positive, as we walked around the place it was much dirtier and more industrial than Fulidhoo; there’s even a prison occupying one corner of it. The island is closer to Malé and is a much larger tourist destination than Fulidhoo and it’s quite clear from only a few minutes there. The main attraction of Maafushi isn’t really the island itself, but all the watersports centers there. Diving, sailing, wind surfing, kite surfing, paddle boarding, snorkeling, jet skiing, wake boarding, you name it and they offer it. There are a bunch of shops all over town specializing in watersports, so organizing an activity is easy. We decided to double down on wind sports, and sailed a bit the first day and spent the following two days wind surfing, at which I failed spectacularly. Oona, on the other hand, was a natural and mastered the board and sail pretty easily. We organized our activities through Active Watersports, and we were pretty happy with their overall level of service. They clearly know their sports, and most of the employees are also super talented at a wide variety of them, but their teaching (at least with wind surfing) left something to be desired. Rather than any real instruction, they were basically like “go there, then turn, then come back!” which is clearly a lot easier said than done. 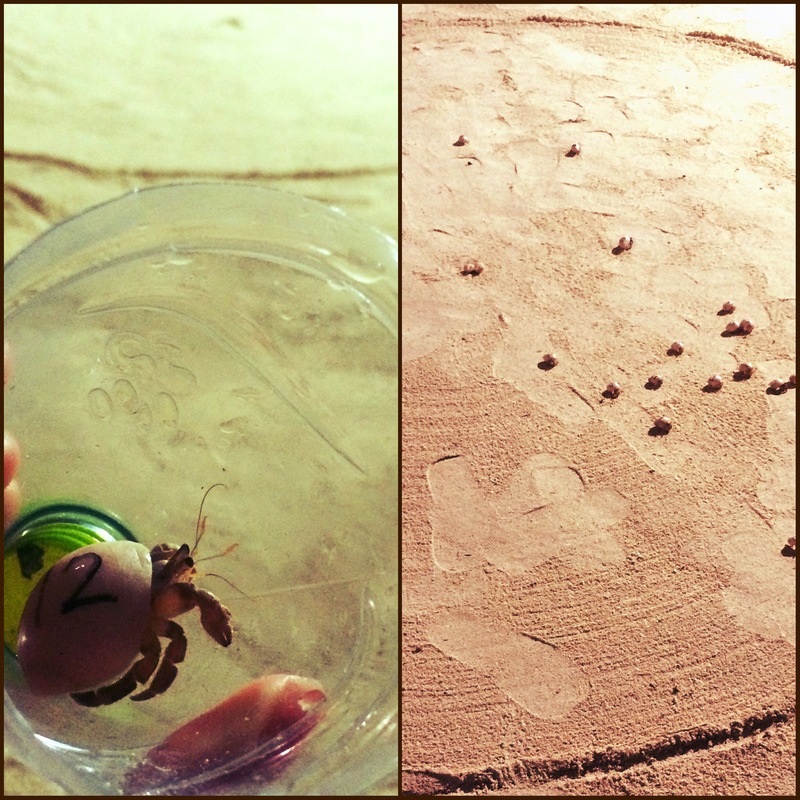 Active hosts a hermit crab race every Tuesday and Friday at 9pm, as well, so we got to take part in that. They hand out numbered hermit crabs and put them in the center of a big circle in the sand and whichever one reaches the edge first is the winner. They hand out some pretty good prizes to 1st, 2nd, and 3rd place winners too. We stayed at Leisure Boutique Hotel on Maafushi. As if a name like that wasn’t suspicious enough, the place wasn’t particularly nice, it was pretty cheap, though. For local food on Maafushi, check out Hotel Rocket (which isn’t actually a hotel, as far as we can tell) on the main street. There’s also an awesome little bakery called Fine Bake by Suzy down the street, try the banana cake if you’re into that sort of thing. All in all, Maafushi wasn’t as bad as we first thought. The increased tourism certainly makes it a more lively place, especially at night, but Fulidhoo definitely captured our hearts. The whole country was such a beautiful and captivating place that we’re already planning our next visit. 10 days was definitely not enough time to explore all we wanted, so we plan on staying at least a couple months next time. The trip from Malé to Mumbai was pretty uneventful, and we’re settling in here in Mumbai for the time being. We’re definitely looking forward to leaving here on our trip northward, so stay tuned for our next installment! The language of the Maldives is called Maldivian or Dhivehi, and it’s an Indo-European language closely related to Hindi and Marathi. The language is written in a unique right-to-left script (called Thaana) adapted from numerals from Arabic and other Indian languages. The writing system is an abugida, but with mandatory vowel marking using over-line diacritics. There is a relatively standard latinization in use in many places. Among other things, this latinization confusingly incorporates orthographic idiosyncrasies of English, resulting in o /o/ and u /u/ but oo /uː/. In addition, as in many languages of India, there is a dental~retroflex contrast. This contrast is reflected in the latinization by an obstruent-following h, thus Thulusdhoo /tulusduː/ but Thoddoo /toɖːuː/. Due to the influence of Islam, Arabic was a major source of loan words in Maldivian, resulting in (among others) the common phrases shukuriyyaa and assaalaamu alaikum as “thank you” and “hello” respectively. Pingback: Our Year of Traveling – Sometimes the wrong train will get you to the right place.